Operated through the University of Northern Iowa's Center for Energy and Environmental Education, Green Iowa AmeriCorps is a community service program. Our organization was founded in 2009 to address conservation and sustainable usage of energy resources in several Iowa communities as they struggled to rebuild from the devastating floods of 2008. Since the start of the flood recovery, Green Iowa AmeriCorps has been an active community partner. Members are trained as energy auditors and contribute to a comprehensive home energy program. Other involvement in the community includes deconstruction projects, creating energy educational programs for all ages, and assisting in the development of energy-related community events. We have seven sites spread throughout Iowa in Black Hawk, Dubuque, Jefferson, Linn, Polk, Johnson, and Winneshiek counties. In 2010 Green Iowa AmeriCorps was listed as one of the most innovative AmeriCorps programs in "Transforming Communities through Service: A Collection of 52 of the Most Innovative AmeriCorps Programs in the United States" by Americas Service Commissions and Innovations in Civic Participation. 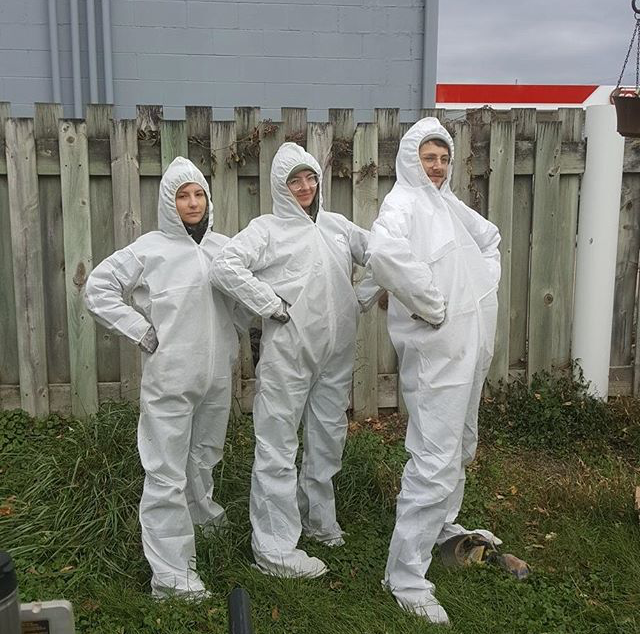 Chosen from 1,100 State Service Commission programs, Green Iowa AmeriCorps was selected for our weatherization and energy audit services. According to the publication, these services produce a lasting community impact by "providing residents with reduced utility bills and the education to become more conscious of energy use. This will enable Iowans to reduce overall demand for power and promote an energy-independent state." In addition, we were recognized for our collaborative efforts with other service programs and for potential of program replication. Helping make Iowans more energy efficient through free home audits, free low-impact home weatherization, energy education, and community outreach. To sign up for a free home energy audit and weatherization, call (515) 471-8686 ext. 104, or go to http://www.greeniowaamericorps.org/signup. For questions, feel free to email greeniowadm@gmail.com. Looking for a place to donate your old holiday lights? 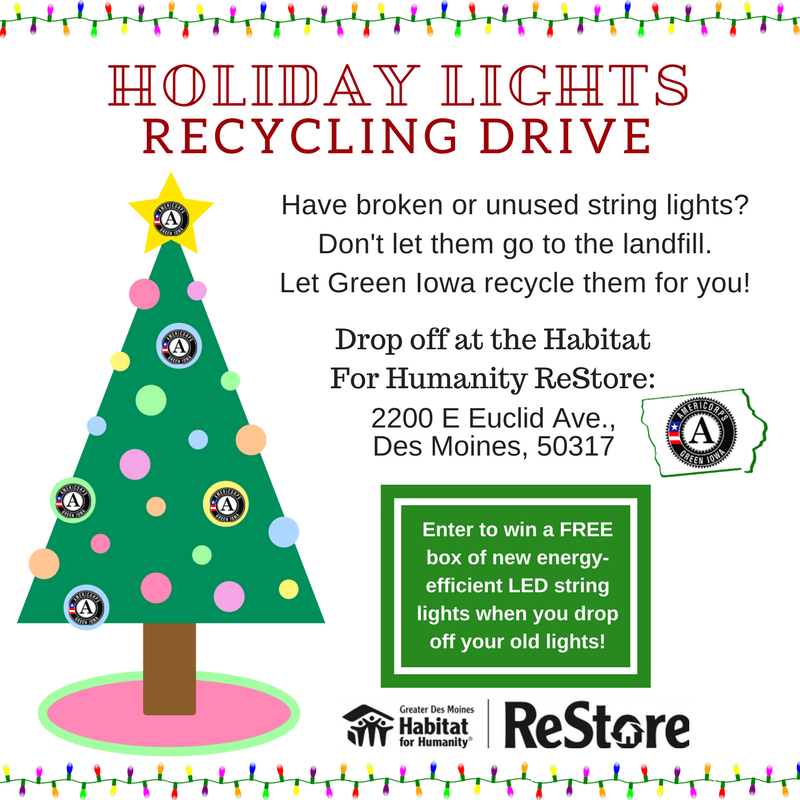 Green Iowa AmeriCorps and Habitat for Humanity are running a Holiday Lights Recycling Drive! Drop off your old lights at the Habitat For Humanity ReStore, 2200 E Euclid Ave., 50317 now through January 15th. ***Enter to win a FREE box of new energy-efficient LED string lights when you drop off your old lights! !